Hi Dandi Crafters! I hope your Christmas was a happy one and you got all your Christmas Crafting done in time! Ours was just lovely. For today's Take Out Tuesday I want to introduce you to Red Bird. My daughter has been drawing birds for the past few days and boy they are CUTE. She has a reindeer bird with antlers. With her drawing birds these past few days it got my thinking about my own little red bird that I first drew over 2 years ago. I thought he would be perfect to turn into an SVG with Valentine's Day coming up since in his design he sports 4 hearts. He is just plain cute. You can make him whatever color you wish however whether he is purple, blue, orange or black, he is STILL RED BIRD. LOL That is his official name. The thing about red bird is although he is cute if you get his parts in the wrong place he tends to start looking not so cute, because of this in his body layer I have chosen to make guide cuts so you will know how and where to position all the pieces. 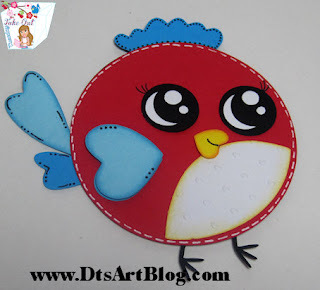 I have been drawing Red Bird and featuring him in auction templates, websites, scrapbook papers and other things for quite sometime now. Red Bird is close to my heart. If you do something with Red Bird I would love to see it, leave me a link so I can see what you have done. I provide Tuesday Take Out as a thank you to my followers and regulars.It is available on Tuesdays and Wednesdays for download on Thursday we throw out the leftovers. If you are not already a follower you should consider becoming one so you don't miss any more Take Out Tuesdays. Hi Dandi Crafters! Happy Take Out Tuesday to you. Are you ready for Christmas, have all your projects done? Yea me either but I am very close to being done. 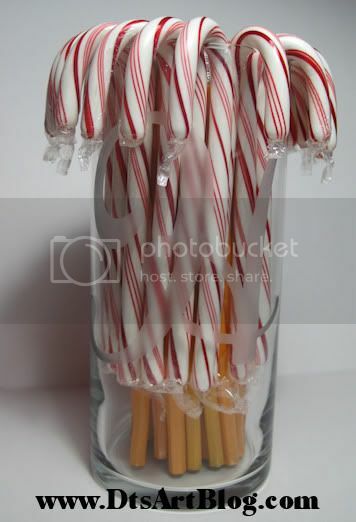 Today's Take Out Tuesday is a Peppermint Heart. I thought this would be good with Valentine's Day Crafting right around the corner. I provide Take Out for my regular readers and followers as a thank you. Take Out is available for download on Tuesday and Wednesday. Thursday we throw out the left overs. Enjoy! Hi Dandi Crafters! Today I thought I would share with your what my daughter is giving to her classmates. M&M Treat Sticks. These are so easy to make and put a smile on everyone's face. I used the little reindeer from Cricut Cartridge Create A Critter. The scalloped circle is also from that cartridge. The reindeer is cut at 2.5 inches and the scalloped circle is cut at 3.25 I believe. 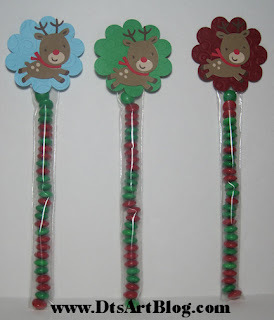 To attach the Treat Stick Bags we used a 1.5 inch circle sticker that says Merry Christmas from my daughter. It was a great way to attach the scallop circle. 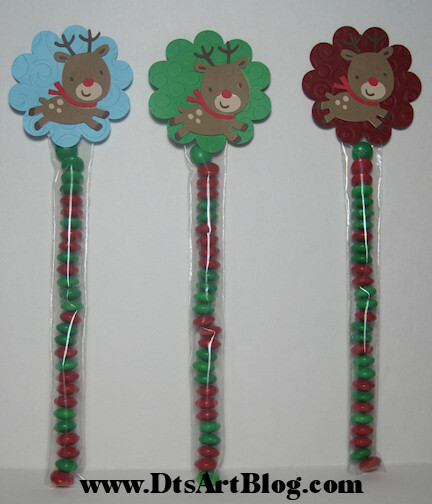 The kids can simply peel off the sticker to get to the candy opening without having to rip up the reindeer. I always keep some of these little bags laying around my craft room so I know that I can alway make up something on the fly without planning. The less planning I have to do especially around the holidays the better. If you would like to purchase some of these little 1x8 inch bags you can do so at GT Bags. Hi Dandi Crafters. Today I want to share with your what my daughter is giving her teacher, a post it note message center and a Pencil Holder. 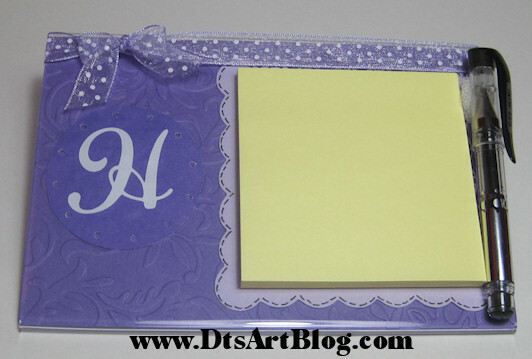 The post it note message center is made using a 4x6 frame. Mrs. H likes purple and polka dots. I have noticed often when I see Mrs. H around her desk she is often searching to find a small piece of paper to write down information for a parent or 2. I am hoping this will help her just a little bit with that task. Last year we gave a pencil holder to her teacher Mrs. D and she really seemed to like it and used it so we thought Mrs. H might like one too. I etched an H on the glass. If you look at the picture you will see the H. It looks very pretty in r/l. Happy Crafting everyone I hope all your Christmas Crafts are coming out like you want them to! I used my SCAL enabled cricut to cut each letter out twice using a deep cut blade. I taped the cereal box down even though my mat was still very sticky. I cut each letter multiple time. I used Arial Black for the font. I cut each letter at 8.5 inches high. I then cut strips that were 1.75 inches high so that each of my letters would be 1.75 inches thick. I measured each part of each letter and cut them as wide as they needed to be, remembering because they are chip board that they do have mass so I had to allow for that thickness. The S was a little stinker to GLUE!! I will tell you that much. The straight edge letters were actually pretty easy! To glue the letters I used Judikins Diamond Glaze. 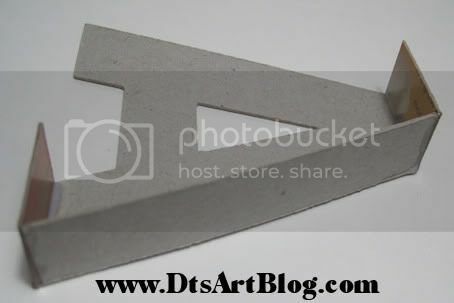 As a rule of thumb I don't use this to glue things however I knew from using Judikins Diamond Glaze that it set pretty quickly although not so fast that you don't have time to work with the chip board. When it drys completely it dries glossy which really doesn't matter however it has a STRONG hold when it is totally dry! After each letter was dry I spray painted them white. It wasn't necessary really however I find spray painting faster and a much more even finish. I then painted the sides of each of the letters S N A red I painted A and T silver. I then covered each letter with K&Co Secret Santa Designer Paper. Remember if you want the same paper for the front and the back as mine are You must MIRROR the second letter. I cut each letter out in the paper again at 8.5 inches tall. There are no pictures of the back although the paper are the same just no little characters on the back. I use Mod Podge Glossy to attach and seal each paper to the letters. I used about 3 coats. 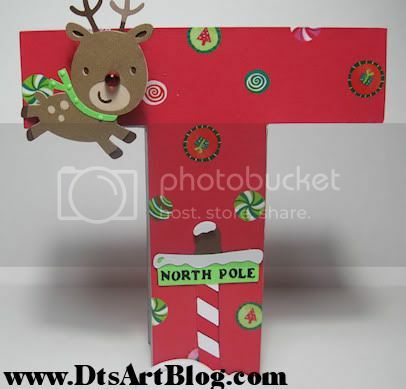 I like this look the letters look very finished, but not overtly glossy even though I used a glossy finish. 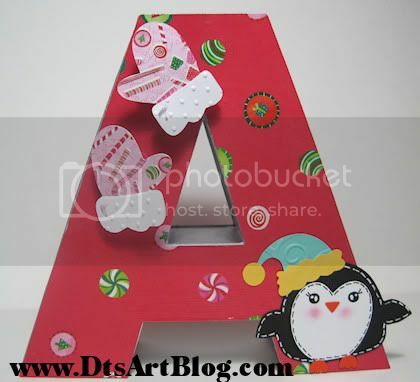 I then use the very cute and my brand new Cricut Cartridge Jolly Holidays to decorate each letter. My new FAVORITE cartridge The reindeer with the gem nose is from the Cricut Cartridge Create A Critter. I love that reindeer! 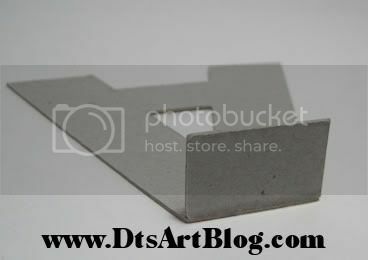 Most of the die cuts are cut about 2-3 inches high. I used pop dots to give some layering depth to some of the die cuts. I also used circle punches and 28 gauge wire to make action wobbles on the fly for some spring action movement. This adds a lot of fun to my Santa letters. 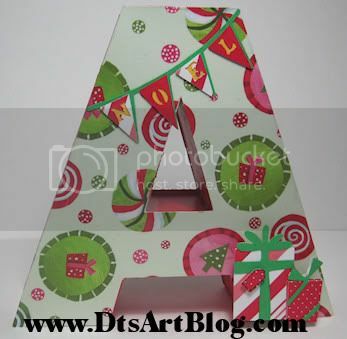 There you have it a pretty inexpensive way to add some holiday cheer not to mention that this project is LOADS of fun! One last picture from the side so you can get an idea of the depth of the letter. Edited to add assembly photo for those that have questions. I have the letter A cut out. 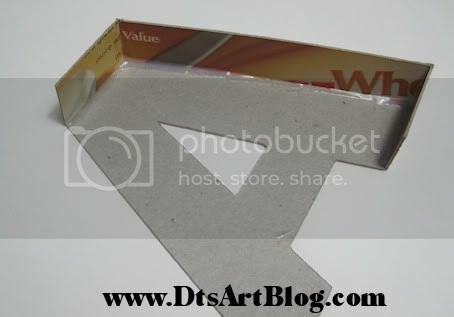 Those that have straight edges are easier than those letters that have curved areas. In this first photo you can see I have my Arial Black A face cut out. I also have a couple of pieces of the sides. Notice that each of the side pieces although different lengths are the same width. This is IMPORTANT. You have to decide on how thick you want your letters to be then stick with that measurement. I made my letters 1.75 inches thick. It doesn't matter how thick you make your letters just that you pick a size and stick to it. In the second step I glued the top of the A. You want all pieces on the top and bottom to be the exact measurement of the segment of the letter that you are working on. In this step I am working on the top segment. 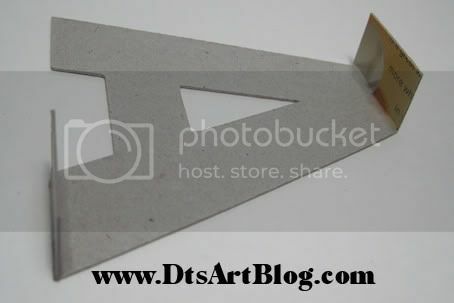 It needs to be the EXACT length of the top of the A. I cut my side pieces close to what they need to be however I like them a bit longer than they need to be because I take my scissors and very patiently cut off tiny amounts until my sides measure exactly the length of the segment of the letter I am working on. I think I need to repeat that last part in case you just skimmed over it. The top and bottom parts of the letter, in other words the horizontal pieces of each letter need to be the exact length of the segment. A different view of it. 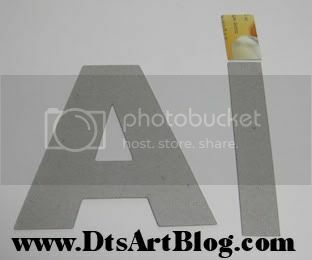 In the picture you should notice that the top segment that was glued was glued to the letter itself. It is not glued adjacent,next to, the face of the letter. 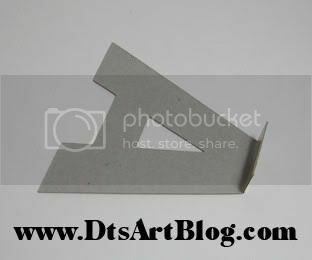 You glue it to the back of the face of the letter so you do not change the original face dimensions of the letter. Notice that the top segment starts and tops with the top of the face of the A. It meets both open sides flush. In the third step I added a bottom piece. Again you want this segment to line up evenly with the segment you are doing. I know you are wondering why I kept going on at length why your horizontally pieces need to be exact in the length matching each segment of the sides. It is because now that we have started working on the vertical segments as shown in the next picture they are no longer going to be the exact size of the segment but rather we are going to take our scissors and patiently trim the ends of the side segment pieces to fit in between the horizontal segment that we were so careful to make exact. You do the same to each segment of your letter making your way around the whole letter, remembering to make sure you also do the inside middle triangle part of the A. I usually did the insides of the letters after I got a complete side finished. Here is the completed side from another angle. 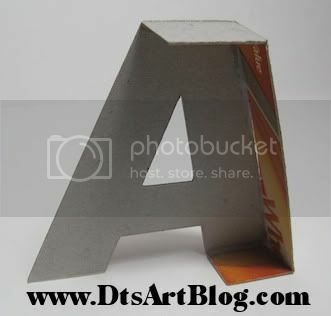 As you can see by this last picture, the 3D letters stand pretty easily and sturdy even without being fully assembled. This is due to the fact that the horizontal segments are flush and even with the face of your A. All assembling sides need to be flush with the edge but not hanging over. When you are done assembling all the sides of your letter. You simply drop the second face of your letter on to the top and let it dry. I hope this helps you assemble your own letters. Honestly they really are pretty easy to assemble. I just wanted to give you the benefit of what I have learned when assembling my letters. Hi Dandi Crafters! Happy Take Out Tuesday to you. How is all your Holiday Crafting going? Mine, whew! It seems every time I finish one project my holiday crafting list grows by 2. LOL! Well once again I am going to try and make your holiday crafting a bit easier with this cute little Hot Cocoa Mug Template. If you are a regular reader of my blog you may remember that the one shown above was the hot chocolate template I made for the Oct/Nov issue of Ready Set Create E Magazine; although, this is the first time I have made it available for download. I provide fresh Take Out each Tuesday for my followers and regular readers as a thank you! Take Out files can be downloaded on Tuesday and Wednesday, on Thursday we throw out the left overs. You may want to become a follower so you do not miss any more Take Out Tuesday. I hope you enjoy the hot chocolate mug template and it makes your holiday a bit easier and brighter because my followers and regular readers certainly make my holiday brighter and merrier. Hi Dandi Crafters! 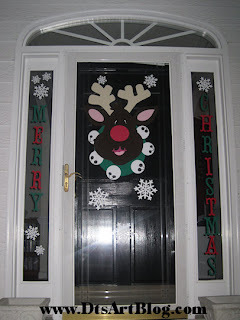 I wanted to share my Holiday door with you. I used vinyl to decorate it. Some of you may notice the red nose reindeer as the SVG file download from Take Out Tuesday a couple weeks ago. I just made him EXTRA LARGE and cut him out using my 12x24 mat. 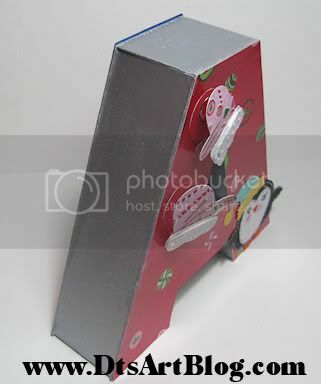 The Merry Christmas is from the Cricut cartridge Storybook. 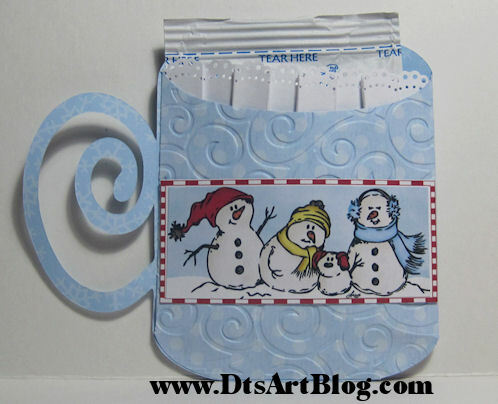 The snowflakes are from the retired Cricut Cartridge Christmas Solutions. I was very please with the way it turned out. It was my first Extra Large vinyl project and it turned out to be easier than I thought. Hi Dandi Crafters! Happy Take Out Tuesday to you. I hope your holiday crafting is going well. Mine is well under way but I am always surprised how long it takes to get all the projects done, LOL! Today's Take Out Tuesday Download come from my own crafting needs this week, a lip balm holder. Anyway, this year she is giving her little girl friends Christmas Lip Balm, so I made this cute little lip balm svg cut file. The lip balm file is super easy to put together only 2 layers. Again you will need to get your magnifying spectacles out and get in a well lit room so you can see the score marks on the lip balm cover. The inside layer is scored a bit deeper but you may still need a well lit room to find them. I like to have score marks when I do a project I just can't stand it when it leaves noticeable marks the paper. The reindeer you see decorating the front is from Circut Cartridge Create A Critter. My daughter is putting one on each lip balm holder for her friends as a Christmas Ornament. Take Out Tuesday can be downloaded on Tuesday and Wednesday. On Thursday we throw out the left overs. I provide Take Out Tuesday Downloads as a thank you to my followers and regular readers. If you are not already a follower you may want to consider becoming one so you do not miss any more Take Out Tuesdays. Did you miss the download? You may want to try this Holiday Gift Card Holder post. The Holiday Gift Card Holder Link will remain active until Christmas. I have turned to you my followers, those of you that besides me use my files to give me a little guidance as to which program I should go with Sure Cuts Alot 2 or Make the Cut. What to you think? What are your experiences with either program? Maybe you like that I always post my files using SCAL 1 because I am not the only user still using SCAL 1 like I think? Maybe you used one and switched and are just in love with it, maybe you just want me to stick with the same format because that is what you are used to, just let me her your voice on the subject. I really look forward to reading your comments and I appreciate everyone who will take the time to comment to help me make my decision.